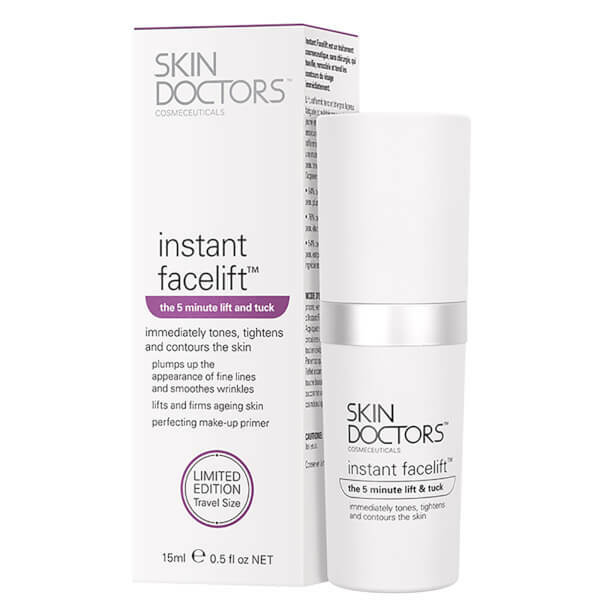 Transform the look of ageing skin with Skin Doctors Travel Sized Instant Facelift, a fast-acting anti-ageing formula that delivers an immediate firming and lifting effect. Helping to eliminate signs of ageing while priming skin, the five minute, non-invasive 'lift and tuck' provides an instant facelift effect, quickly tightening and contouring the appearance of skin for youthful-looking results. Plumping out the look of fine lines and smoothing the appearance of wrinkles, it will visibly transform the complexion. 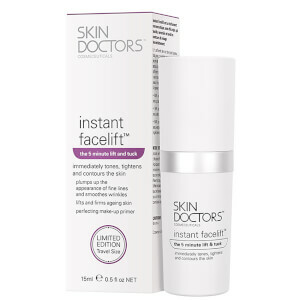 Instant Facelift is formulated with a cocktail of beneficial ingredients that work in synergy to promote a smoother, firmer-looking visage. Sesaflash is a patented active ingredient and tightening agent that utilises Sesame to visibly smoothen the look of skin while keeping the face hydrated with long-lasting results. Easyliance (a naturally produced biopolymer) forms a matrix on skin's surface while drying, which promotes an immediate lifting, tightening and smoothing effect. Hydroviton® 24 is an advanced, 24 hour moisturising complex that penetrates skin, allowing it to breathe while retaining moisture for a soft, supple-looking complexion. Mature skin appears firmer and younger. Leaves the complexion mattified and doubles as a perfecting makeup primer. After cleansing, dispense a few drops of Instant Facelift on your fingertips. Apply in a circular upward motion on the face, avoiding the eye area. Wait a few minutes to feel the instant effects. Aqua (Water), Glycerin, Isopropyl Myristate, Stearic Acid, Acacia Senegal (Acacia) Gum, Glycol Stearate, Glyceryl Stearate SE, Acrylates Copolymer, Petrolatum, Paraffinum Liquidum (Mineral Oil), Polysorbate-60, Triethanolamine, Glyceryl Stearate, Hydrolysed Rhizobian Gum, Dimethicone, PEG-100 Stearate, Cetyl Alcohol, Imidazolidinyl Urea, Carbomer, Parfum (Fragrance), Phenoxyethanol, Pentylene Glycol, Sodium Lactate, Lactic Acid, Serine, Urea, Sorbitol, Sodium Chloride, Allantoin, Stearamide AMP, Disodium EDTA, VP/Polycarbamyl Polyglycol Ester, Hydrolysed Sesame Protein PG-Propyl Methylsilanediol, Methylparaben, Ethylparaben, Propylparaben, Butylparaben, Hexyl Cinnamal, Limonene, Linalool, Geraniol, Citral.